Full Member of the Russian Academy of Sciences; Doctor of Historical Sciences; Professor; Academic Director of the Institute of Oriental Studies, Russian Academy of Sciences. 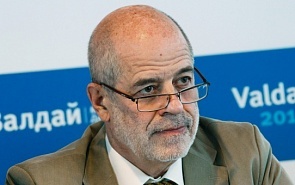 Editor-in-chief, “Vostok (Oriens)” journal (since 1998); Member, Science Council, Russian Foreign Ministry and the Russian Security Council; President, Center for Strategic and Political Studies (since 1991); Goodwill Ambassador for the Alliance of Civilizations by the UN Secretary General (since 2007). Previous positions: Head, Arab countries Department, Institute of Oriental Studies, RAS (1984–1989); Deputy Director, Institute of Oriental Studies, RAS (1989–1994); Visiting Professor, American University, Cairo (1991); Head, Center for Arab Studies, Institute of Oriental Studies, RAS (1994–2009); Visiting Analyst, Abu Dhabi TV Satellite Channel, UAE (2001–2002); Visiting Professor, University of California in Berkeley (2003); Member, High Level Group, UN Alliance of Civilizations project (2005–2006); Founder and Chairman, Center for Arab and Islamic Studies (2006–2009). Research interests: Islam; international relations; international security; regional studies (Middle East, Central Asia, South Caucasus); South Arabian studies; conflict management and resolution; ethnology; evolution of Islamic movements; South Arabian ethnography; conflicts among the CIS member-states. Author of over 500 publications in Russian, English, French, Arabic and other languages dealing with the history of Asia, the Arab world, Central Asia and Caucasus, international relations, political science, Islamic studies, philology, conflict management and resolution. ﻿﻿Many experts consider the turbulent Middle East events as a clear testimony that a brand new world order is being born. At prestigious Middle East forums, they hold entire panels devoted to this issue. Since any child is born in pains, this circumstance easily explains all the troubles in the region. Is it really so? By the strikes against Syria, the US and their allies achieved demonstrative effect only partially. It was achieved, because like in the previous illegal bombings of sovereign states (Yugoslavia, Iraq, Libya, etc. ), they exhibited their military power, unprecedented arrogance and readiness to completely ignore the international law. It was partial, because the Syrian Air Defense Forces shot down most of the missiles. For Russia, that means a victory. Russian-made weapons have coped very well with the task, writes Vitaly Naumkin, Academic Director of the Institute of Oriental Studies, Russian Academy of Sciences, in his comments for valdaiclub.com. The upside of the situation following the airstrikes of the US-led coalition on Syria under a false pretext is that both the coalition and Russia, allied with the Syrian government, have managed to keep restraint, writes Vitaly Naumkin, Academic Director of the Institute of Oriental Studies, Russian Academy of Sciences, in his comments for valdaiclub.com. ﻿The Syrian National Dialogue Congress, held in Sochi on January 29-30, showed that the Syrian society is ready for reconciliation. The Congress, which has been recognized by the UN, reinforces the negotiation process in Geneva and gives it a new impetus. In 2016 the world has witnessed the deterioration of the crisis in several Middle Eastern states, Russia's expansion and affirmation in the region, increased number of its regional partners. Where Does the Middle East Go? Luck or failure of the Syria settlement in a large extent would determine the fate of the entire region, because long ago the internal Syrian conflict acquired the regional and global status. For Turkey, such priorities as curbing Syrian Kurds and support of the Turcoman population in the area where the Russian aircraft was shot down, still remain, and they will be certain obstacles for the normalization of Russia-Turkey relations. China may increase military supplies to the Syrian government, but direct military involvement is uncertain.